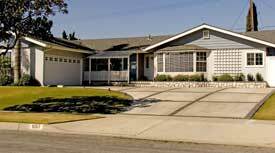 The Ranch style -- also known as the American Ranch, Western Ranch, or California Rambler -- is an extension in time of the bungalow, but it is an example of a bungalow designed for an upper middle class. The Ranch style was loosely based on the Spanish colonial ranch dwellings of the southwest, but evolved for the automobile and new, open-air lifestyle exemplified by Southern California. By the mid-1950s, sprawling, low-slung Ranch houses began to take the place of the small sized, mass-produced tract houses in new Southern California developments, and the quick replacement reflected the vast wealth and national pride during the postwar era. Californian Cliff May (1908-1989) is considered the father of the Ranch house. He designed the first Ranch style residence in 1932, built in San Diego. In 1936, May, who was also a builder and promoter, joined the staff at Sunset Magazine in selling the Ranch house as the ideal dwelling for Californians during the post-World War II boom. In 1946, May and Sunset published Western Ranch Houses, an instant bestseller that helped to further popularize modern Ranch houses as the key to the good life. 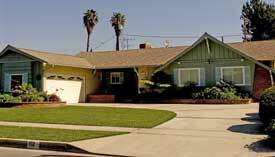 Ranch houses are the single most prolific residential design in Fullerton and in California. The northwest section of Fullerton, and in particular the Sunny Hills area, is noted for its large number of Ranch houses. The following tracts or subdivisions feature Ranch style dwellings: Fullerton West, Fullerton Ranchos, Fullerton House Estates, Sunny Hills Estates, Valencia Park, Country Hills, Chapman Luxury Estates, Chapman Estates, Beverly Terrace, and Berkeley Park. The Ranch style period ran from the mid-1930s to the 1970s. By the 1970s, home buyers began to grow tired of the predictable floor plan, with rooms strung along a central hall. Moreover, the vast and flat building sites required to showcase these sprawling homes to its best advantage grew scarcer. By the 1980s, developers began to focus on two-story floor plans as a way to accommodate ever-bigger homes on smaller lots. The Ranch home is often dismissed because it is so common. Because the houses are so uncomplicated, critics complain that the Ranch house has no style. The Ranch house, however, has had a recent revival. This renewed popularity has sparked the publication of new books on the style by architectural critics who extol the open, simple, and functional floor plans of these houses. New owners of existing Ranch houses are also enlarging them, creating larger footprints often with extra wings, larger kitchens, and family rooms. Hess, Alan. The Ranch House. New York: Abrams, 2004. Includes a tour of well-known ranch houses in California, Arizona, and Texas. McLendon, Sandy. "To a Rancho Grande," Old House Interiors. March 2002: 30-33. Samon, Katherine Ann. Ranch House Style.1 st ed. New York: Clarkson Potter/Publishers, 2003. "Split Decision: The Split-Level House Was the Sleeper Hit of Postwar Bedroom Communities." Old House Journal April 2002: 78-83.